C. Aiano and Sons, Ltd. is the leading maker of wire mesh window guards for churches and heritage buildings. We have been hand crafting high-quality, custom-made, hand-woven mesh window guards for churches and heritage buildings from the very beginning of our 157-year history as a company. This makes us the oldest and most experienced manufacturer of window guards in the country. 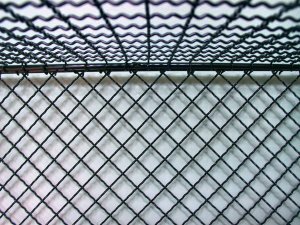 While we make now window guards from both pre-fabricated weld mesh and hand-woven mesh, for much of our existence we used hand-woven mesh for all our products and applications. When AIANO began, the mesh for church window guards was made in straight lines and laced together. Lacing is not practiced regularly anymore because it is too labour intensive to be practical for most products, but at AIANO we try to keep the different methods of making mesh alive. Figure 1—AIANO wire workers weaves the mesh using methods practised continuously for the last 157 years, and handed down from generation to generation. Later the ‘pushed up’ method was adopted as an evolution of laced mesh, whereby the two horizontal woven strands were literally pushed together as shown in figure 1 and then laced in position. However, it was quite time consuming to ensure the straightness and evenness of the lines and during the 1960s AIANO gradually switched to using two parallel horizontal wires spaced ½” apart, and this is the method still used today. 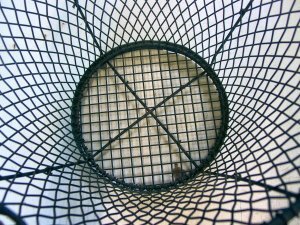 Weld mesh appeared in the 1960s but a significant proportion of AIANO products such as air vents and machines guards were still being made from woven mesh, typically ½” x ½” 16g woven mesh during the 1970s. While many of our more standardised products are now made using weld mesh, such as radiator guards and light guards, AIANO has continued its tradition of excellence in woven mesh wire working for church window guards. 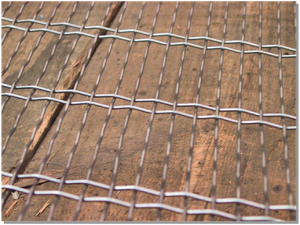 The standard weld mesh used for window guards is 3” x ½” x 12swg. For the majority of church windows, we use 4” x ½” hand-woven mesh which seems to strike the correct balance between strength, aesthetics and economy. Mesh spaced significantly more widely than 4” x ½” would not be strong enough for its purpose. On the other hand, more closely spaced mesh is more expensive to produce and masks more of the natural beauty of window and stonework. Diamond mesh can be made in varying sizes and materials. The diamond mesh is more labour intensive than the more common 4” x ½” mesh used in most window guards but produces beautiful results. Our skilled wireworkers can produce seamless diamond mesh as illustrated in figure 4 below. Looking down on this basket made from continuous diamond mesh it is impossible to spot the join. 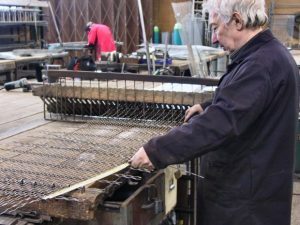 C. Aiano & Sons Ltd.
C. Aiano & Sons Ltd., the leading maker of wire mesh window guards for churches and heritage buildings has been making window guards using traditional methods handed down from generation to generation of wireworkers since 1860. Aiano makes window guards from both woven mesh and weld mesh according to the requirements of the job. However, with 157 years’ experience making window guards we believe the traditional woven mesh methods are the best. Woven mesh guards are longer lasting and have a natural hand-crafted beauty that is more in keeping with the fabric of the church – beautiful stonework, beautiful brickwork, beautiful stained glass…. And beautiful window guards.